Cambrian life and evolution: First eyes - Trevor D. Lamb et al. Royal Society Publishing October 2009. Now I understand the fighting spirit in the Scientific America 2011 preview - Trevor D. Lamb is a friend of Richard Dawkin and thus presents one side in the Atheism/Creationism coin. Charles Darwin was acutely aware of the importance of explaining the evolution of 'organs of extreme perfection' such as the eye and in recent years there has been remarkable progress in understanding how the eyes of vertebrate and invertebrate animals have evolved. In this Theme Issue, leading figures in the field draw together our current understanding. 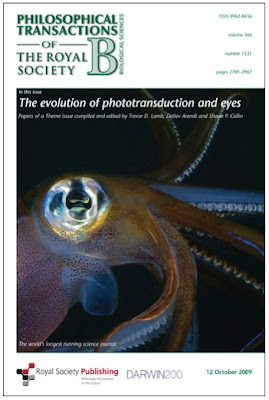 The contributions span the range - from the origin of the simplest forms of light detection in primitive organisms more than a billion years ago, through the strategies adopted to improve photoreceptors, to the origin of simple shading eyes, and their evolution into modern visual organs with outstanding performance. A common theme running through the articles is the vast amount of information that is available through examination of the genes of different organisms. Thus, much of the evolution of vision can be traced through the genes that specify neural development and eye development, and the genes that encode visual pigments (opsins) and other components of phototransduction (the conversion of light into a neural signal). This collection of work represents our current knowledge of the evolution of photoreceptors and their incorporation into eyes. The approach to understanding the origins and evolution of eye in this modern publication is different from the traditional "go and find fossil evidence" method. Instead of hunting for those probably extremely rare survivors of early photosensors these scientists study the Book of Life, DNA, in order to reconstruct the history of the eye. I have opened another blog God, DNA and evolution because Evolutionary Genetics is a very specific and significant field of research of the origins of life before the Cambrian period. "through the strategies adopted to improve photoreceptors, to the origin of simple shading eyes"
It is not so far from the learned language of Sam Gon III and others who occasionally use the verb evolve in active mode. We laypeople get the impression that some trilobites evolved long spikes to balance them while swimming and others actively adapted to the environment by effacement that made burrowing life style easier myBlog. These rather Promethean attitudes are prevalent today. As an alternative I am not suggesting introducing religion into science, far from that! We have no ability to understand how God relates to His work, we can only study His work and praise His wisdom. Instead, let us just keep the rules of the game clear: this fabulous collection of research articles is in the field of genetics and scientifically describes what may have probably taken place in the past. A comprehensive explanation showing full understanding of why things live and grow and evolve it definitely is not. Future generations of scientist will look at our top knowledge of the evolution of eye as we look at the knowledge of Charles Darwin and his generation... before George Mendel.